Salts are compounds that bring together positively charged metals, like calcium or magnesium, and negatively charged non-metals, like fluorine or bromine. 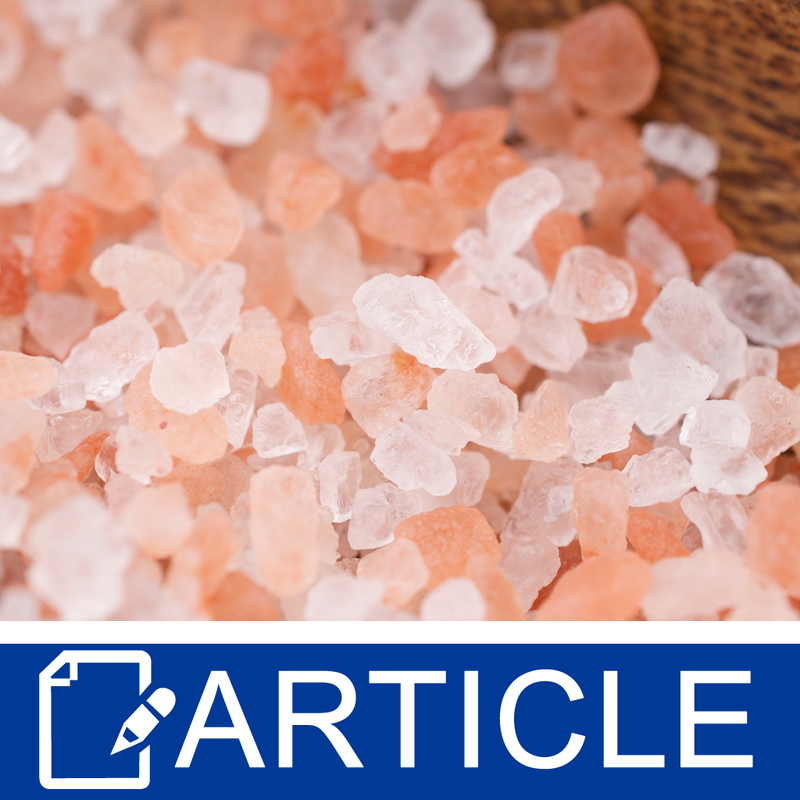 While table salt (sodium chloride) is the one we encounter most often, there are so many other interesting ones, like potassium chloride, found in “half salt” products; sodium nitrate, used to preserve deli meats; and calcium chloride, a road de-icer. Salts are extremely soluble in water, meaning they dissolve easily, producing electrolytes or ions that conduct electricity well. Which salt you choose for a product depends upon their different crystal structures. They can range in size from small (1 to 2 mm) to medium (2 to 3 mm) to large (4 to 8 mm), and larger still. They can be coarse or fine. Generally, the smaller the crystal, the finer it is. They can be used in all sorts of products like body scrubs or soap bars, but the most common way is in a bath product like a salt, bomb or milk. Soaking in a hot bath increases blood circulation, decreases blood pressure and makes mobility a little easier as we float. Adding our lovely salt based products increases moisturization and hydration of our skin, and can reduce unpleasant sensations like itching or stinging. Epsom salts (INCI: Magnesium sulfate) are found as medium to large coarse crystals, which hold on to fragrances or color better than smaller crystals found in table or fine sea salt. We generally use magnesium sulfate heptahydrate (called this because it contains seven water molecules, hepta- means 7, for each magnesium sulfate) over anhydrous magnesium sulfate, which is used as a hygroscopic ingredient to draw water from the atmosphere. Sea salts (INCI: Sodium chloride or Maris sal) are generally produced by evaporating sea water and may be called by many names including bay, ocean or river salts. Their crystal structure may range from small to large, fine to coarse and they contain all kinds of elements like sodium, calcium, potassium, magnesium, strontium and bromine. Potassium has been demonstrated to reduce transepidermal water loss and inflammation, while sodium has good water holding capacity. Strontium may decrease itching, stinging and burning, while calcium may enhance skin’s barrier repair. Dead Sea salts (INCI: Sodium chloride or Maris sal) come from the Dead Sea, which is about 32% salt (12% to 18% sodium chloride) compared to ocean water at 3.5%. They contain a number of elements with magnesium, sodium, calcium, potassium, bromine, iodine and zinc making up the majority. The crystals range from small and fine to large and coarse. Studies have demonstrated that using Dead Sea salts in the bath may improve skin’s barrier function, which leads to less transepidermal water loss, less roughness and inflammation and more hydration in our stratum corneum (top layer of our skin). These benefits seem to be related to the magnesium and sodium content in the salts, both of which bind to water to increase moisturization. Solar salts (INCI: Sodium chloride or Maris sal) is a generic name for any type of sea salt produced by evaporation by the sun. The crystals may be small and fine to large and coarse depending upon processing. Himalayan salts (INCI: Sodium chloride) are mined salts from deposits in the Himalayan mountains. Their colour ranges from white to pink to orange, depending on the levels of copper and iron, and you can find them in almost every form from fine, small crystals to large, coarse ones, as well as in slabs. They’re 95% to 98% sodium chloride, with the rest composed of polyhalite, a hydrated sulfate of potassium. Dendritic salts (INCI: Sodium chloride) are fast dissolving star shaped crystals with large surface areas designed to hold fragrance and essential oils well and reduce clumping. The suggested usage rate is 5% in your soaking recipes. When formulating, minimize the water to which salts are exposed to avoid dissolution. Lotion based scrubs are not a salt’s best friend, so choose oil based instead. Choose your grain wisely. Finer salts are generally a better choice for exfoliating compared to coarser salts, but they’re all good in soaking products. Salts with a large surface area hold on to fragrances longer than smaller ones. Feel free to mix and match your salts. 5% Dendritic salt with 5% Dead Sea salt combined with sea salts or Epsom salts is an awesome combination! 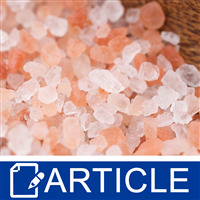 "Is Dead sea salt only supposed to be used at 10% of total salts in bath soak recipes?" Staff Answer It is recommended not to add more than 10% because of the amount of moisture this salt attracts. It can ruin a recipe if adding more than this.